Stretch your legs along the spectacular Italian coast, from Levanto to Portovenere. * Discover a swathe of medieval marvels, such as the castle and churches of Levanto and the Abbey of San Fruttuoso. Upon return enjoy all the amenities of your ‘feature stay’ hotel in Levanto, which includes a pool, a sauna and a wellness centre. Arrive in Levanto, centrally located on the Ligurian coast. No activities are planned for today, so you can arrive at any time. If you arrive early why not head out and explore Levanto’s colourful streets. After the group meeting, enjoy a first group dinner together in the hotel restaurant, where you will dine on local specialties. In the evening you can take a relaxed stroll through the town to take in the atmosphere of this seaside location. Special Information: A group transfer from Pisa Airport is provided in the afternoon for your convenience. The transfer will be at around 4:30 pm, however please enquire at the time of booking to reserve a spot. This evening you will meet your trip leader and fellow travelling companions at a welcome meeting (this is usually at 6 pm, but check with hotel reception for the exact time and place). In this meeting, your leader will give you a briefing on what lies ahead. 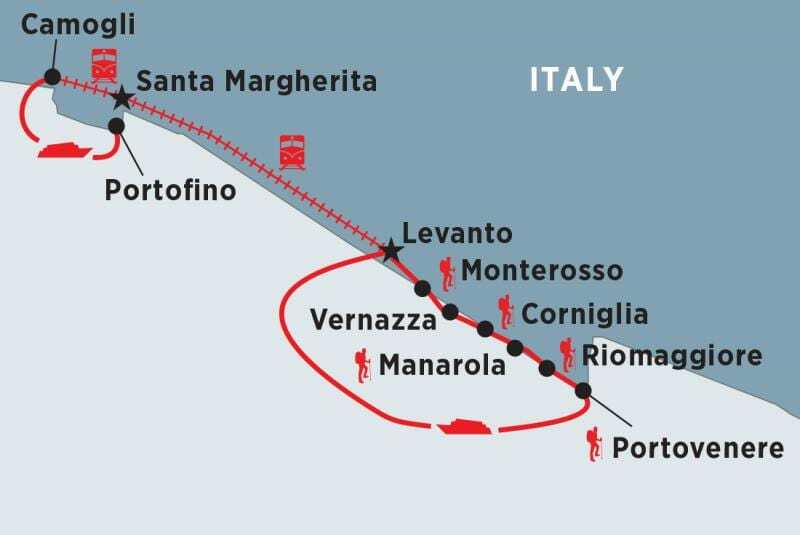 Special Information: Walking distance: 10 km; approximately 3-4 hours; or 15 km if returning to Levanto on foot. Special Information: Walking distance: 9 km; approximately 4 hours. Please note that due to recent landslides in the area it is not possible to walk the full extent of the Via dell’Amore between Riomaggiore and Manarola, and the coastal section between Manarola and Corniglia. For these sections you will be taking the train instead. 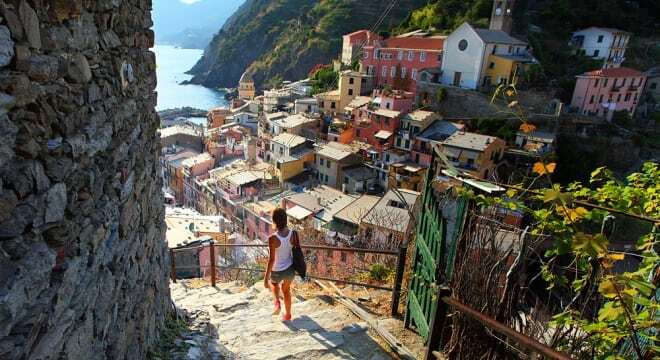 Begin your day with a short train ride back to the tiny village of Riomaggiore. Embark on a walk that leads you to Portovenere at the very end of the peninsula. Today’s trail is the most challenging of the Ligurian walks; it’s also perhaps the most rewarding. First you will walk up a rather steep flight of stairs, then along an undulating track to reach the sanctuary of the Madonna di Montenero (those who wish to opt out of this climb can catch a bus instead). After stopping at the sanctuary for a short break, continue your walk to Campiglia. Continuing uphill you will follow the contours of the coastal cliffs, passing terraced vineyards and enjoying wonderful views of the coastline. Pass the abandoned village of Lemmen and walk high on the ridge through vineyards and pine forest. Finally descend to the little village of Campiglia, where you can stop for lunch and some refreshments. Then continue towards Portovenere and enjoy even more spectacular coastal views. When you arrive at the 16th-century castle above the village, you might be able to catch a glimpse of the distant peaks of the Apuan Alps before you descend a long staircase that takes you to St Peter’s Point and then into the heart of the village. After some free time to relax in Portovenere, return by boat to your base in Levanto – a lovely way to see the coast from the water – just in time for a group dinner. Special Information: Walking distance: 16 km; approximately 6 hours. If you’d like to relax on the beach in one of the villages and spend less time walking today, you can catch the train at various points along the way. If you walk to Framura only, it will take approximately 3.5 hours (9 km). Please also note that your main luggage is going to be transferred by vehicle today, so you will only need to take your day-pack. Today you’ll see the best of the Portofino Peninsula. First take a short walk through the historical centre of Santa Margherita Ligure, where you can also do some shopping for your picnic lunch. Then start a walk into the hills and enjoy beautiful views across the bay. By late morning you will reach Portofino, one of the most typical Ligurian seaside villages and a popular resort for jet setters. Explore this charming village and take the scenic walk to the church lighthouse, where you can look back on the inlet of Portofino (the name of which translates into ‘fine harbour’). Then head uphill and take a break in the woods and enjoy your picnic lunch. From here you can either join the leader for a walk back to Santa Margherita, or relax and return by boat or bus later in the afternoon. In the evening, meet your group for a farewell dinner in Santa Margherita. Your trip comes to an end after breakfast.